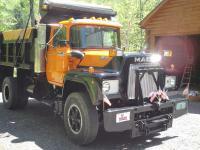 I've been a Mack truck lover since I was a kid and drove some Macks in my working life. Now that I am retired, I have finally bought my first Mack: a 1981 single axle R611ST to use and play with ! I live deep in the Vermont woods in a log home on 10 acres. I like cats, the Three Stooges, and of course, Mack trucks, especially R Models. I worked for 24 years for the Post Office, and drove a Postal trailer truck for 13 years. I work as the Director of Music for the local Catholic church in these retirement days. Mike, while you are looking for a proper horn button if you can find the horn relay you could run a separate wire off it to something hot under the dash with an accessory fuse to one of those old fashioned horn buttons they are still sold in parts stores.Just find a place to mount it that's accessible but doesn't screw up the dash! Underdog, on the subject of our once proud steel industry,my best friend is from Warren oh and were talking the other night about Copperweld, U.S. Steels Homestead Works is another tragedy,The largest Bessemer converter in the world now houses a Dave and Busters restaurant and a couple other minimum wage type facilities! The o/o hauling " untarped slab" from Homestead to Clairton works (less than 20 mi) were earning 1000.00 a day with old day cab R models! The problem as I see it is not unions,it's union greed the reason we needed unions in the first place was corporate greed! Okay, thanks. That's what i was thinking, too. I'm going to try that and let you know. Mikesbucketlistmack posted a gallery image in BMT Member's Gallery - Click here to view our member's albums! I found this in the back of a local guy's truck shop. Looks like it's a 5 speed gas job. What exactly am I looking for with the ohmmeter and to which terminals do I attach the leads ? Check any big city's Post Office Vehicle Maintenance facility near you. They will direct you to where they do sell the used ones off at times. I used to drive for them in the 90s. I had a brand new single axle MR, automatic. They special ordered them WITHOUT air conditioning or radios. They were pretty good with a trailer on but don't ever bob tail one in the rain. They were also terrible on snow and ice. I don't know if there are any more Mack MRs out there. I think that they have gone to all conventionals now or are just renting tractors from Ryder. Thanks, Ron. I finally got some time and disovered that a strange looking unlabeled button on the dash works the city horn. Someone must have reconnected it when the steering wheel button failed a long time ago. On my 1980 R611ST, it looks like someone disconnected the engine block heater wires. I want to reconnect them but which terminals do the black (hot) and white (neutral) AC wires go to ? It looks like the green (ground) gets connected to the bottom screw. And what gauge wire should I use ? Thanks, guys ! I'm trying to get the steering wheel horn in my 80 R 611 ST working. It looks like it's been disconnected as there is a black wire with a push in end hanging out of the steering column (see picture). I checked under the dash for the other end of a wire that might have been connected to it but there are no loose wires. I checked the horns by running a wire from them to the battery and they work. I followed the horn wires all the way to the horn relay in the glove box and there are no breaks. Any ideas where this wire from the steering column should be connected to ? What would happen if I connected it to an empty terminal of a power block under the hood ? Try Global Truck Traders in Winchester, NH. They are always dismantling old Macks and have a ton of old parts in their warehouses. You can find them on globaltrucktraders.com. They're very busy and never get back to you by phone so usually it's best just to go up there and walk through their place and find what you want. Also, the best Mack dealer I've found to get new and old parts is Utica Mack in Utica, New York. Call them at (315) 797-1714 . Ask for Dan Kiss. He's gotten me plenty old parts for my 1980 R 600 and ships out in one day. Okay, thanks. I was thinking of the one in Ballston Spa. The only problem is that my truck is geared so low that the top speed is only 53 mph ! I don't want to be a hazard on the road if I have to take any interstate highways to get there like I-87 ! Does anyone know where one can find out about trucks shows in the New England or upstate New York area ? Thanks ! Yeah, it used to be a municipal truck that never went out on the highway so they probably didn't need the speed. Anyone needing parts for their Macks contact Dan Kiss at Utica, New York, Mack dealership. Phone number 1-315-797-1714. E mail is dkiss@umack.com. He gets right back to you and can find parts for newer trucks as well as old ones like mine. Tell him I referred you.